"You guys are walking in grace," the Reverend Alice Roberts says to Pat at my daughter's wedding. It strikes a cord and gives me goose bumps. I know something very special is happening to us. It feels like we are living more life than either of us ever thought possible a few years ago. We talk often about how lucky we feel being on this journey and each time we talk about it, even though it is a repeat of a conversation we had only a week ago or a month ago or 6 months ago - it is new, affirming and thrilling. How did we get here? How can we stay? Who do we thank? 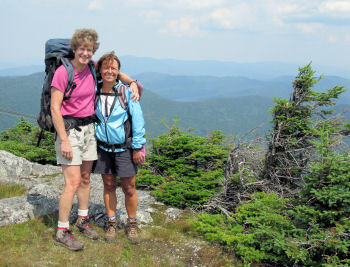 We arrive at the Jay Peak trailhead at 9:30 and head up the mountain on the Long Trail. I am thrilled we are hiking a trail and not a ski slope, remembering the incredibly steep ski trails at Sugarloaf in Maine. 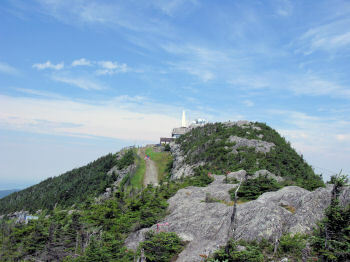 There is a marathon going on and people are running up Jay Peak today. Wowsers. I think I'll walk. We reach the top at 11:30 and have an early lunch before we start our bushwhack over to Big Jay. The views are hazy. Both Pat and I are in good spirits, talking about the fact that we feel like we are riding a wave, or as Alice says, walking in grace. I guess the simplest way to say it is our lives feel blessed. Really, that's it in a nutshell. Blessed. My life feels blessed by our mountain climbing, where almost every Saturday I get the chance to walk with Pat in nature, coming up above the tree line to be awed by the magnificence of the view and the new perspectives the experience gives me. Our exercise routine of spinning, running and muscle blast feels blessed too. I know, maybe it sounds silly to say exercise is a blessing, but every day I get to feel how strong and fit my 54-year-old body has become. Me! Nancy! Having weighed 70 pounds more than I do now, there are days I can't believe it is me running and lifting weights and spinning like crazy. Believe me, I feel blessed. I am so blessed by my family. Don, my husband of 31 years, and I just joyously witnessed the marriage of our daughter, Kelly, to Justin in a beautiful ceremony and reception. We've always been proud of our daughters, but in moments like weddings the feelings reach such immense proportions that I was just overflowing with love and pride for Kelly and Jess, and so happy to welcome Justin formally into the family. I could have ruined the wedding for myself, and spent the entire time worrying about everything. Or I could have chosen to be smaller than I am, to hide in the activities and not be fully present in my strength, beauty and knowing. You know what I mean; many of us tend to hide our beauty, or become chameleons, adapting to what others want from us. I'm pretty good at that. But lately I've been coming out in bigger, bolder ways. I made a choice at the wedding to be fully me, and once the commitment was made, the rest was easy. I chose to remain in me and enjoy the wedding as Nancy and let everyone else deal with their own lives. And you know what? I felt so full of myself and of my love for Don, Kelly, Jess and my new son I was bursting with happiness. After the wedding we all went to Seattle to meet Justin's family who could not come to the wedding and were treated to a delicious family barbecue. We also hiked the Klahhane Ridge in Olympic National Park with the most beautiful scenery and flowers I have even seen in my entire life. Blessed. There just is no other word for it. Blessed. From the top of Jay Peak, we head down and easily find the Long Trail off the ski slope and are now focused on finding the left hand turn to the herd path that will lead us to Big Jay. We take a left on the first path we come to, but it ends abruptly. We turn around and continue on down the Long Trail a bit further and see a snow fence. Pat checks out the path beyond the snow fence and is sure that is the herd path. So under the fence we go and from there the trail is easy to follow. We run into a few more snow fences. Pat thinks they are up to prevent snowboarders from following the trail in winter. The mud on the trail is boot-sucking hungry and it is impossible to stay clean and dry. We are creative and work hard at avoiding the deepest mud holes, which requires lots of tree hugging, spruce grabbing, rock hopping and log jumping, all resulting is mud-splashing laughter. We encounter more mud and more snow fences, obstacles that could make one question continuing. Most of the fences have been cut with wire cutters and the wooden slats pushed back so a person can get through. A few have not been cut but are loose enough so one of us can pull the fence up while the other gets on hands and knees and crawls under. It is clear to me someone does NOT want us there. But who? Why? Turning around did not even enter my mind and we continue. More fences and lots of ferocious mud and black water. By now I know that the longer I THINK about what route to take around the mud, the more I sink in where I am standing. So I just keep my feet moving and, for the most part, I get out semi-dry. Every once in a while one of us will take a wrong step and the sucking sound as we pull our boot out of the mud cracks both of us up. The hike is not particularly steep, but between the mud, fences and blow-downs to work around or climb over, we are going slowly. 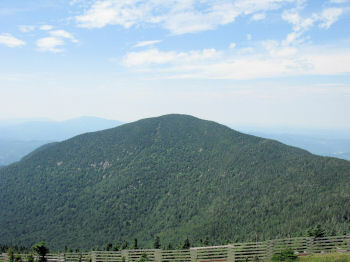 It takes us about an hour to get to the summit of Big Jay. 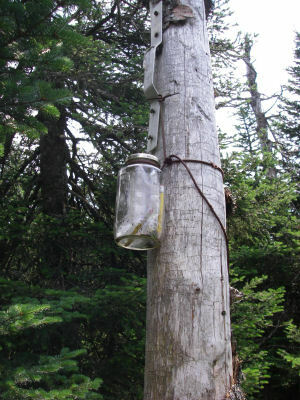 Immediately I see a glass jar attached to a tree trunk where the canister used to be. We take out the papers and read the other two entries - one from a guy last week wondering about the "assisine fences." 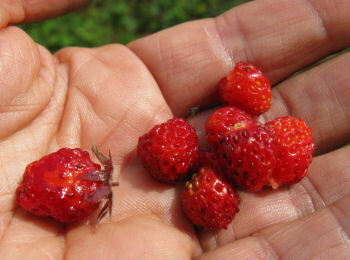 We add our entry, put it back in the jar, take a picture in the wooded summit and start back. I wonder about the person who took the canister and with it the written history of those reaching the summit -- such a beautiful sharing gone. It is a shame. 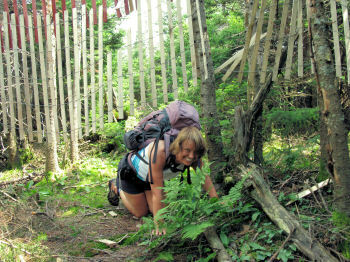 But I LOVE the resilience of hikers. Nothing stops them. The canister is gone - well, here's a jar - let's use this as a way to connect! Thank you to the person who put the jar in the canister's place, for reaching out to the rest of us. Pat and I decide to get pads, pens and jars and make sure we always have one set in our packs in case we encounter another bushwhack without a canister on the remaining 100 highest. We decide to count the fences going back. I think there are 10. Pat thinks there are 12. The mud, blow-downs and fences don't even slow us down on the way back. We know what to expect. Of course, we can't make it back without a little mishap. I am walking across a log, lose my balance and in very slow motion I fall, backpack first, into a deep, wet, gross black mud hole. I feel myself going and am surprised how gently I land. The water immediately seeps in, everywhere - I am lying sprawled out in the mud and both Pat and I are laughing. Of course, Pat can't give me a hand without getting in herself. So, by the time I am out of the mud hole, we are both covered with mud and laughing hysterically. More mud, more fences, more laughter, this is number 10...11...12...13...14...15 fences! A bit overkill don't you think? As we connect back with the Long Trail, I notice the back of a sign very high up in a tree. What does that say? I ask. We both look at it. It says that Big Jay is closed for revegetation due to illegal cutting and erosion. Whoops - missed that going in. But the sign would not have stopped us. We are climbing the 100 highest and Big Jay is on the list - so we are on a mission. And all someone has to do is tell me I can't do something and I am pretty bound and determined to do it. I guess that is the rebellious part of me. Nothing much stops Pat and I and that is how we live. We are two determined girls. It seems that when we are in our hearts, our decisions come from inside. Maybe that is why the fences didn't worry us, didn't make us pause and talk about turning around. We listened inside and knew Big Jay was waiting! We follow the herd path back to Jay Peak and then down the Long Trail to our car. On the drive back, we decide to take a detour to see Pat's mom and her sister. We enjoy a wonderful dinner with Peg, Warren and Pat's sister Sue. A perfect way to end a perfect day! On the way back in the car, Pat and I continue our conversation about walking through this life on a path of grace. It feels like we are riding a wave. "What do you think grace really is?" I ask. "I think grace is a state of being...like the filter through which I can see and love," says Pat. "So you think grace is an inside job," I say as my eyes stinging. Pat nods and I look out the window, letting that in. "That's pretty awesome to think that is in me." I say in tears. Then I say, "I was doing my usual thing, looking for the answers outside of myself, putting someone or something else in charge. I always forget the answers are inside... and that it is only what is inside that matters." Walking in grace, we're not in charge, our hearts are, and stuff just happens. And it turns out that the stuff that happens is incredibly awesome the way it fits together and feels so right. Living inside out, that's it. And even when we face hard times, like Pat is today as she puts her 3-year-old dog down, grace carries us through the experience. Still painful, still horrific, cushioned by grace. I've never felt this way before. But I am sure I am in it - grace, that is. And I am sure Pat is in it too - grace Pat style. And Don and Kelly and Jess and Justin - we were all walking in grace at that wedding. No doubt in my mind. It feels like I have given away control to my heart, my inner voice is calling the shots and I'm just along for the beautiful ride. And you know - it's not hard - this ride I'm on. It's EASY! Holy moly! Who knew? My life is running perfectly. And when will it end? Only when I want it to. When I start to doubt it or question it, or try to make sense of it or worry about it or change it. Then I fall off the grace wagon. And I get back on...of course.